Last edited by PrivateDonut; 11-16-2017 at 02:00 PM. This is useful if you wish to use your own MySQL server, rather than the one provided in my repack. vmaps (0.9 and above.) -- Mediafire - Required for version 0.9. These files belong inside the core -> data folder and are required for the server to successfully boot. If you are currently running version 0.8, and you don't want to lose any data such as character progress, custom items, etc. Then you can follow the steps below in order to update your repack to the latest version. Close both the authserver and worldserver, if they are running. Download the latest copy of this repack. Copy the new executables(authserver.exe & worldserver.exe) to your core folder inside the 0.8 repack folder. Locate the world database changes inside of Extras\Updates\worldnamed world_updates. Import world_updates to your 0.8 world database, ensure you are running the mysql server for your 0.8 server. If you have any problems updating from 0.8 to 0.9, please post in this thread for support. Warning: Whilst this repack is considered AC-Web exclusive I do not mind you sharing this repack on other sites, if you do want to share it contact me first, and then use my links / mirrors. Thank you for understanding. If you'd like to read a change log of a previous revision, or find the download link for that revision, please use these links. You'll be redirected to one of the change logs scattered over this thread. Yes. Warden anti-cheat is implemented. (Molten-WoW's "Sentinel Anti-Cheat") By default it is set to only log any detected cheats, but you can make it kick or ban any cheaters if you so desire desire. You can find the source here. This repack is a fresh Trinity Core compile. I do not apply any patches nor do I make extra fixes. The change logs are lists of all fixes made in the commits to the master repository. How do I add scripts? Not everything in the database is localized! This repack is and will always be an English project. Official localizations were added from MoP but will not be maintained. If you want to have a fully localized database I'd advise you to compile your own core and or use a third party language patch as found on the Trinity core fora. I will try to keep this repack updated at least once or twice every two weeks. I will announce it inside this thread, along with some of the changes made in the newest update. Is there a Linux or OS X version of this repack available? I have plans to make a Linux version of this repack, but OS X isn't planned at the moment. This may change in the future. Why isn't the upcoming change log updated daily? Because not all fixes are extensively listed. (e.g: "Thousands of NPC fixes.") I couldn't list them due to being short on allowed characters per post, and, there are just too many to type! Please add this custom code and or fix this! Fixes will be added whenever they're made, accepted by Trinity Core and tested. I will never add custom code to this repack. When will this repack go to patch 4.x or 5.x? There are plans, but that comes at a later time. Is this repack Windows XP compatible? No, it is not. Since this repack requires .NET framework 4.5 this repack will only run from Windows Vista Service Pack 2 and onwards. Windows XP is no longer supported by Microsoft and an upgrade to Windows 7 or later is advised. Trinity Core - For the core and database. Jeutie - For the portable MySQL server, and his permission to use his thread format. Zaxer - For the control panel used in this repack. Katos - For creating us such an amazing logo. Ghostcrawler336(me) - For compiling and setting up this repack. Last edited by PrivateDonut; 01-25-2016 at 09:51 PM. Any plans to start working on the original AC-Web repack of 2.4.3? 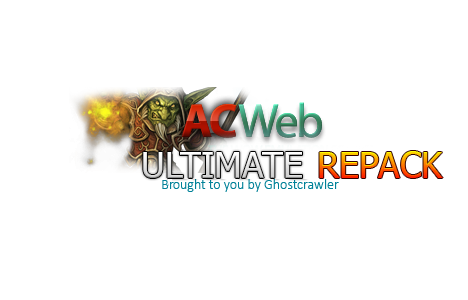 Looks great bud, thanks for reviving the ac web ultimate repack! I haven't really thought about it, I thought about releasing high patches such as 4.3.4 or 5.1. But I'll think about it, as I don't know how popular it would be. Thank you, if things go as planned it'll be around for awhile. Just carrying over the old repack name, that Jargs used to manage. Awesome! Nice to see another well managed 3.3.5 repack! I fixed a typo on your image (see brought vs. bought).